Reading and share top 9 famous quotes and sayings about Mathematical Logic by famous authors and people. 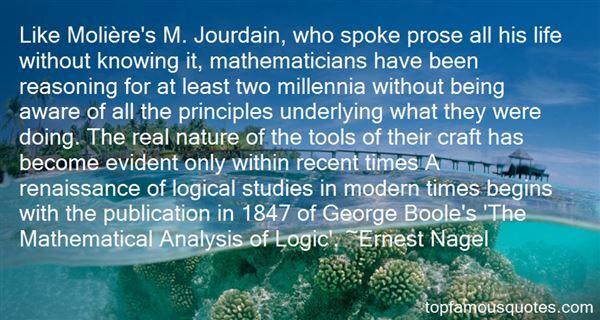 Browse top 9 famous quotes and sayings about Mathematical Logic by most favorite authors. 1. "It is all about numbers. It is all about sequence. It's the mathematical logic of being alive. If everything kept to its normal progression, we would live with the sadness--cry and then walk--but what really breaks us cleanest are the losses that happen out of order." 2. 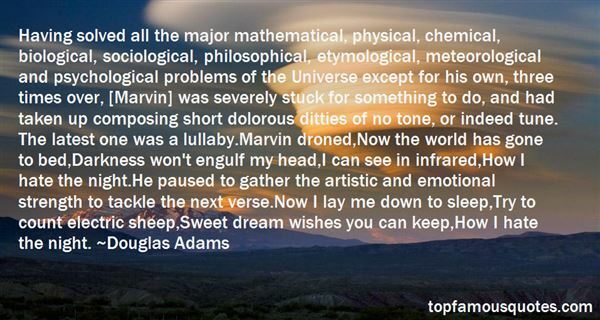 "Having solved all the major mathematical, physical, chemical, biological, sociological, philosophical, etymological, meteorological and psychological problems of the Universe except for his own, three times over, [Marvin] was severely stuck for something to do, and had taken up composing short dolorous ditties of no tone, or indeed tune. The latest one was a lullaby.Marvin droned,Now the world has gone to bed,Darkness won't engulf my head,I can see in infrared,How I hate the night.He paused to gather the artistic and emotional strength to tackle the next verse.Now I lay me down to sleep,Try to count electric sheep,Sweet dream wishes you can keep,How I hate the night." 3. "Like Molière's M. Jourdain, who spoke prose all his life without knowing it, mathematicians have been reasoning for at least two millennia without being aware of all the principles underlying what they were doing. The real nature of the tools of their craft has become evident only within recent times A renaissance of logical studies in modern times begins with the publication in 1847 of George Boole's 'The Mathematical Analysis of Logic'." 4. "I think a strong claim can be made that the process of scientific discovery may be regarded as a form of art. This is best seen in the theoretical aspects of Physical Science. The mathematical theorist builds up on certain assumptions and according to well understood logical rules, step by step, a stately edifice, while his imaginative power brings out clearly the hidden relations between its parts. A well constructed theory is in some respects undoubtedly an artistic production. A fine example is the famous Kinetic Theory of Maxwell. ... The theory of relativity by Einstein, quite apart from any question of its validity, cannot but be regarded as a magnificent work of art." 5. "I have tasted words, I have seen them. Never had her hands reached out in darkness and felt the texture of pure marble, never had her forehead bent forward and, as against a stone altar, felt safety. I am now saved. Her mind could not then so specifically have seen it, could not have said, "Now I will reveal myself in words, words may now supercede a scheme of mathematical-biological definition. 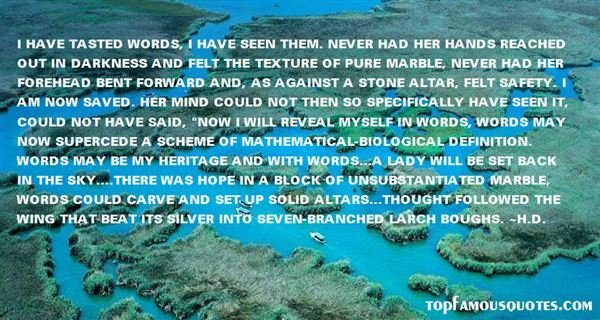 Words may be my heritage and with words...A lady will be set back in the sky....there was hope in a block of unsubstantiated marble, words could carve and set up solid altars...Thought followed the wing that beat its silver into seven-branched larch boughs." 6. "That's right, but it's not a mathematical proposition. It's a sociological observationand there is always the possibility of exceptions to such observations." - Dr. Mandamus to Dr. Kelden Amadiro"
7. "So a) To what extent might human relationship be expressed in mathematical or logical formula? And b) If so, what signs might be placed between the integers? Plus and minus, self-evidently; sometimes multiplication, and yes, division. But these signs are limited. Thus an entirely failed relationship might be expressed in terms of both loss/minus and division/reduction, showing a total of zero; whereas an entirely successful one can be represented by both addition and multiplication. But what of most relationships? do they not require to be expressed in notations which are logically improbable and mathematically insoluble?" 8. "Both for practical reasons and for mathematically verifiable moral reasons, authority and responsibility must be equal - else a balancing takes place as surely as current flows between points of unequal potential. To permit irresponsible authority is to sow disaster; to hold a man responsible for anything he does not control is to behave with blind idiocy. The unlimited democracies were unstable because their citizens were not responsible for the fashion in which they exerted their sovereign authority... other than through the tragic logic of history... No attempt was made to determine whether a voter was socially responsible to the extent of his literally unlimited authority. If he voted the impossible, the disastrous possible happened instead - and responsibility was then forced on him willy-nilly and destroyed both him and his foundationless temple." 9. "Here at Wisconsin we didn't get an undergraduate course in mathematical logic until the '60s." You can have your own watch and always doubt it. If I had a watch I'd probably always be doubting it or the batteries would be dying. I just know that people always have trouble with their watches, and that's why I like public clocks."